An intense relationship. Gemma Paget (left) and Andrew Murton (right). Photograph: Courtesy of Ruth Anthony. Electric writing and a stirring cast, but a narrative that fails to follow through. Pete owns a garage, with his employees Mick and Hud. His staff are planning a heist to bring in some much needed extra cash, whilst Pete struggles with his failing and dysfunctional relationship with wayward alcoholic Carol. But what will give way first? The two idiots botching a robbery, or the couple who’s love and obsessions verge on violent hatred? David Bown’s writing is astonishing. His style and vigour is like Harold Pinter snorting crack off a copy of Nuts magazine: frantic, filthy, and sensational. It’s an unstoppable force of veiled fractured sentences, circular conversations, and maddening repetitions that not only adds pace and thrills, but also creates a dangerous enigma around both plot and characters. Bown also juxtaposes this against an attention to detail that verges on the perverted, exalting his writing to being beyond pedestrian. For example, Pete’s monologues are a wonder unto themselves, perfectly capturing his intense fascinations as he spurts torrents of minutia as naturally and as humdrum as taking a piss. Mick and Hud are also a wonderful written pair of comic mechanic mechanicals. There’s a brilliant synchronism in the two characters, even if their personalities might be at odds, making them an engrossing pair to watch bumble by. But they embody something more than comic relief, and cross over to and play complex catalysts to Pete and Carol’s story at various points. It’s an excellent execution of plot depth and intrigue. However, even thought the play’s crescendo is hectic and deafening, what really lets Loaded down is that after the two story arcs apex with literal bangs, it just doesn’t seem to have amounted to anything. You’re hooked from the beginning with Bown’s intense writing style, having to sit through some brutal and uncomfortable moments of misogyny and sexual violence, to only be left deflated: feeling that you’ve not achieved any satisfaction. Bown’s text even acknowledges that the resolve is, at best, bewildering. But this moment of self-awareness doesn’t make up for the fact that there’s no real pay-off to the narrative. It could be that this is some sort of metaphysical point that Bown is trying to make, and that there’s some higher abstract that I’ve simply failed to grasp. That doesn’t necessarily make this a terrible ending to Loaded, but it certainly doesn’t meet the expectations that Bown so tremendously creates at the start. Christopher Ward (left) and Nick Rogers (right). Photograph: Courtesy of Ruth Anthony. Sean McGarth’s production embodies the level of details that Bown writes. 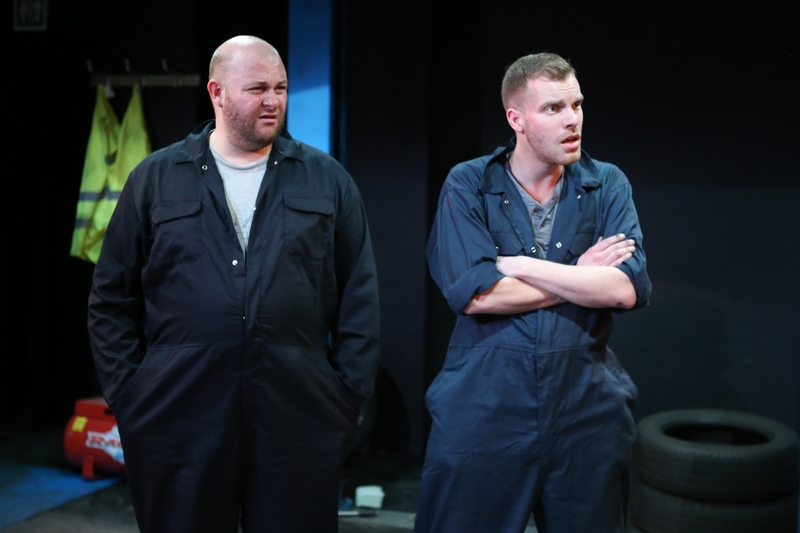 If you hadn’t had ventured to the Jack Studio Theatre before, you could swear that it was an actual car mechanic’s outfit in a life past. But as well as the set being painstakingly realistic, McGarth adds some nice directional details too. The scenes changes, particularly, add a nice sense of continuity between moments, even if you just about see what’s going on in the dim of the dirty fluorescent tube lighting. It gives a sense of that other reality that Bown so craftily keeps almost hidden through his writing, until you’re thrust back into the actual story with a loud crunch of metal against metal and a blinding light change. There are also nice little touches with the choice of music to accompany these scene changes, either complimenting or mocking the action of the scene that’s just been played out. But ultimately, McGarth ensures that the pace never drops, and that it grips tightly around the gullet until the final (if somewhat limp) release of the climax, even if that means keeping the cast screeching through their patter-clad back and forth with almost inhuman haste. But he also makes sure that time is taken in the less break-neck paced moments, to revel in a different sort of intensity: particularly in the moments between Pete and Carol. He lets these more measured interactions, where characters teeter on the cusp of calamity, sink in with painstaking space and speed, resulting in a devious contrast. McGarth’s cast is as intense and dexterous as Bown’s writing. Christopher Ward and Nick Rogers and Mick and Hud respectively have a wonderful comic rapport between them that really lifts their characters’ shenanigans beyond patterful banter. But at the same time, they exude hints of more down to earth realities behind their larger than life exploits that adds a sense of interesting vulnerability to them. 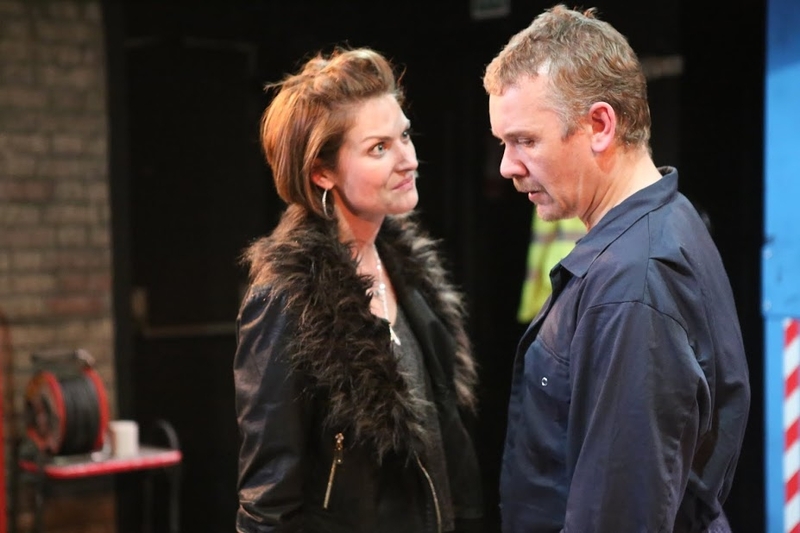 But leads Gemma Paget as Carol and Andrew Murton as Pete really command the entire scene. The chemistry between them on stage is so twisted and spiteful it’s actually difficult to imagine them getting on well with each other after the show. Paget, in particular, is domineering as a human being on a disastrous nose-dive, with a frightening devil-may-care attitude and resilience against her bullying lover, Pete. She’s tragically terrifying to watch, even if she is a character that is difficult to like. Pull up for some of the most explosive writing, pristine production, and exhilarating cast on the fringe. But you might not want to leave the meter running if you’re expecting the pay-off that the show really could do with.